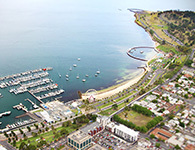 There is a variety of accommodation options in Geelong depending on who you are enrolled with. When you are an International student leaving home for the first time, having a host family can help you to adapt better to the culture by being immersed in the real Aussie family life. You will be provided with a room and meals, which means not worrying about cooking and shopping.See the links below for more information. Kardinia International College, Belmont High School and North Geelong Secondary College offer homestay for their students. If you are a higher education student contact your education institution or Student Accommodation Services. If you are the kind of person that prefers more privacy or you come with your family, you might be thinking of renting a room or getting the lease of a house. You can also lease a house with students and share the expenses. Booking short term accommodation before you arrive will provide you the opoortunity to inspect rental properties in Geelong before committing to a lease. The RentRight App is a free resource with information and tools to help renters in Victoria. For information or advice about your rights and responsibilities when renting contact the Tenants Union of Victoria or visit the Renting page on the Consumer Affairs Victoria website. The video below also provides practical tips.